This thing might be old stuff but it's the first time I've seen one so bare with the enthusiasm. 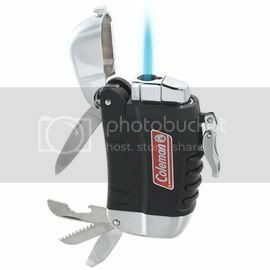 Coleman's Multi-Tool Lighter is probably the only tool you'll need when you go out camping or for any kind of light handyman tasks. It's got everything you need except the kitchen sink. It's definitely a must have for the camping or outdoor geek. This sells for about 26USD or around 1,700PHP here at our part of the world. I'm sure I can find one locally if I try and I'm definitely going to find something with the same concept at a cheaper price. Ideal for outdoors activities such as camping, boating, hiking, etc., this Coleman lighter comes in very handy. It features a torch wind-resistant flame with built-in gadgets such as a knife, filer, bottle opener, screw driver, saw. The rubberized accents on the side helps with better grip. This butane refillable lighter weighs 4 oz. The solid metal body with stainless steel tools make this lighter a perfect gift for outdoor enthusiasts.